When we groom our dogs, we look for certain attributes that make us comfortable with our choice of groomer as this is an important personal decision for both us and our pet. We don’t have time to explain what we want done every time we come in and we want to come back to see our dog looking great, clean and happy. Below is a list of things to look for in a groomer that we provide at our Dunwoody facility. Trust – I want a groomer I know I can trust with my baby, someone who loves dogs, is strict about safety, does not create stress for my dog, and always has my dog’s best interest at heart. I never need to worry when my dog is with my groomer. Experience – I want a groomer who has been doing this for a while and knows what they are doing. Someone who understands dogs and can make recommendations for what is best for my dog, pays attention to detail and consistently delivers satisfaction at every visit. Personal Service – I want a groomer who listens to me and understands what I want, someone I can talk to and feel confident that we are both on the same page. Location – I want a facility that is close by and convenient, clean and organized, and run with honesty and integrity. “After much time spent looking for a new groomer for our Goldens, we found The Pet Resorts-Dunwoody. Trooper and Rugby went yesterday for their first bath and clip. Scott Harris was the groomer and he was wonderful! He spent time explaining to my husband and me what he would do and he spent time with our ‘boys’ bonding with them and checking them for mats, etc. From that moment on I felt that they were in good hands. When we picked them up the first thing I noticed was how happy Trooper and Rugby were. I have never, ever seen them like that after being groomed. The second thing I noticed was how beautiful they looked. I could go on and on, but the bottom line is that I would highly recommend The Pet Resorts-Dunwoody for grooming. The facility is clean, the staff is professional and kind and Scott is an expert groomer who is also very calm which helped to take away their stress from being groomed. More about Scott Harris here. 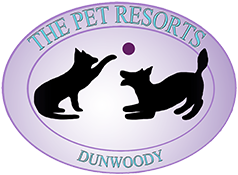 Here is a list of the types of services we provide at The Pet Resorts – Dunwoody. Of course, if there is something you are looking for that is not listed below, we will be glad to discuss your needs with you. The Pet Resorts – Dunwoody dog groomers have years of experience working with fearful dogs, dogs with anxieties, and dogs that have never been groomed. We will never force uncomfortable grooming on your dog just to make a dollar! We will always take special care and use a gentle touch with your toy breeds, small, and petite dog breeds and have an in-depth knowledge of their distinctive cuts and coiffures. Our groomers have worked with larger breed dogs, big boned mix breeds, and giant breeds with the coiffures and cuts they require. Our groomers are kind, reliable and experienced with all breed cuts. We are adept at safely shaving dogs for summer and dremeling and clipping nails on dogs that have long quicks or black nails. Here at The Pet Resorts – Dunwoody, we have knowledge of hard to read dogs’ emotional changes and can recognize the beginning of fear signals allowing us to take immediate care of a shy or fearful dog before they get stressed. Again, your dog will not be manhandled or mishandled to get them out the door just so that cash register can ring!